Orchids and Onions: Janosch, creator of stories. 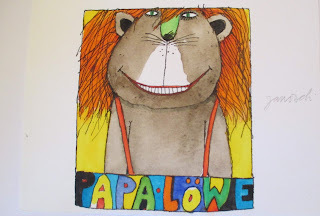 This year the artist, writer, and children's book author, Janosch, turns 85-years-old. Recently, I watched a documentary film about Janosch's life that played on ARD Mediathek. I think I might have had more questions about the secretive Janosch after watching the film than before! Janosch was born as Horst Eckert in 1931 in Oberschlesien, an area of Germany that now belongs to Poland. Born of a devout Catholic mother and a violent, alcoholic father, his was an uphappy childhood. During the Nazi occupation, Janosch saw his neighbors being taken away and buildings in town burnt to the ground. Like PL Travers of Mary Poppins fame, Janosch dealt with childhood trauma by creating what he wished he'd had instead of what was. In Janosch's stories, parents are ever benevolent and children do as they wish. After the war, Janosch tells the filmmaker that the family 'moved' (I can't but help to wonder if he and his family were driven out as so many Germans who found themselves in what became Poland were) to what became West Germany. It was there, Janosch said he was his happiest. The film showed him at a 'school reunion' of sorts where he and his former class mates sat around a garden table and chatted about old times. 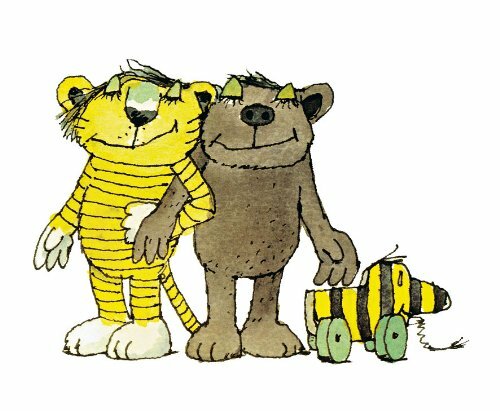 They had no idea that their former classmate, Horst Eckert, had gone on to become Janosch, the famous children's writer and illustrator. One former student mentioned having been envious of Janosch's artist abilites. Unfortunately, Janosch was an unsuccessful art student, having tried, and, ultimately, failed to secure a place at the Akademie der bildenen Kunst in Munich. His was dismissed from school due to, his word, 'Unbegabung' which I translated to mean an 'untalent'. Janosch spent the 60s and most of the 70s writing children's books and the occasional novel. Nothing he published received critical acclaim. By the mid-70s, he was broke and drinking excessively. It was at this point that he decided to unleash a 'Rache-Akt' (act of revenge) on the world. He had grown tired of writing children's books, and, instead, decided to write a 'kitsch book'. For this he said he needed certain elements: a stuffed aninal--a teddy bear, the teddy bear goes traveling, and 'Weiber fangen an zu weinen' (women begin to weep). He set about writing, taking a trip to Ibiza during the process, and, in 1978, 'Oh, wie schön ist Panama!' was published. 'Oh, wie schön...' is Janosch's most famous work and earned him a German literature prize. Janosch has sold over 12 million books. 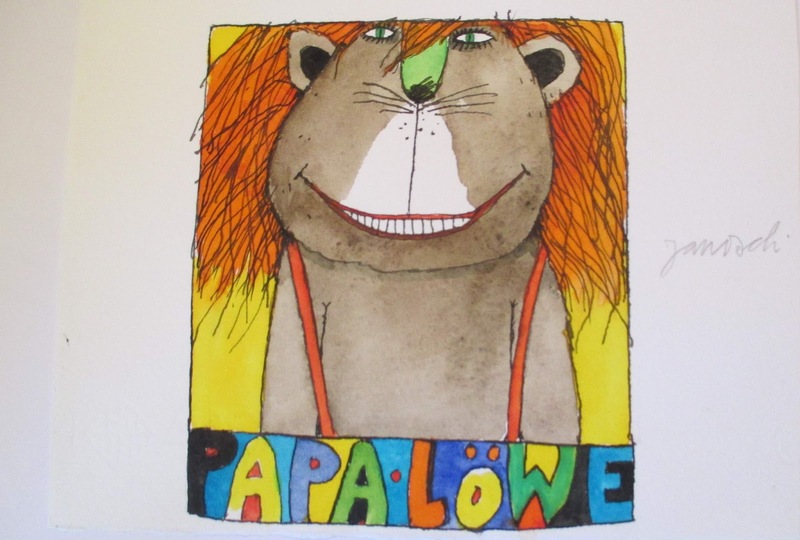 He is regarded as Germany's bestselling children's book author. For the past thiry years, Janosch has lived a life of quiet obscurity on the island of Tenerife. In the film he's shown at home creating bright, abstract watercolor canvases in a space covered with statues from South America & wall hangings of all description. Aside from participating in this documentary, I suspect Janosch rarely visits Germany. Not an author I know - but those characters have a HEAP of charm. How ironic that growing up with an alcoholic father he also turned to drink. He also never had a family of his own & I find that telling. I never heard of him, but I've definitely seen his work. Such an interesting style. And an interesting life! I hope he writes a memoir, I bet that would be a great read. Mich, I think you're on to something! I mentioned the film to my German teacher who said that this documentary came out to coincide with a book either by or about Janosh.